The way Christ’s life proceeds agrees with the way it began. As Christ was born in misery and poverty, so now he is acknowledged only by poor and abject people. He is not visited by kings but by shepherds; he is not worshiped by Pharisees but by magi, who, although they were men of great renown in their own country, were condemned and despised among the Jews. So these lowly beginnings agree with what the Evangelist now describes. 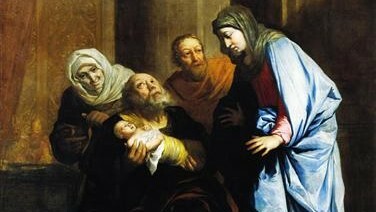 As yet, the priests did not know the child offered in the temple, the high priests did not salute him, kings did not honor him, but only a certain old man named Simeon, a citizen of Jerusalem, famous neither for his riches, his dignity nor his office, comes to salute and embrace the child. It is probable that people thought he was out of his wits, but whatever other people thought of him, Scripture commends him highly, saying that he was “righteous and devout.” And he was given a revelation through the Holy Spirit “that he would not die before he had seen the Lord’s Christ.” Behold here what an excellent gift was given to Simeon beyond all the patriarchs and prophets. Christ was promised to the patriarchs, and his coming was revealed to the prophets. However it was not promised to any of these that they would see Christ in this world with their physical eyes, although they greatly desired it. But both of these things happened to Simeon. “Blessed are your eyes,” says Christ, “because they see, and your ears because they hear. For I tell you the truth, many prophets and righteous men longed to see what you see but did not see it.” And there is no doubt but that this revelation was made to Simeon alone, that from him a general confirmation might come to all the godly.